The Ivory Soap Modern Vintage package design is inspired by a collection of original Ivory Soap packaging and advertisements ranging from the late 1800s to the early 1900s. To stand out from the visual clutter in the body wash aisle, Ivory Soap Special Edition Modern Vintage kept it simple with clean design, robust typography and a vintage-inspired color palette of crisp colors to create an instant American classic. 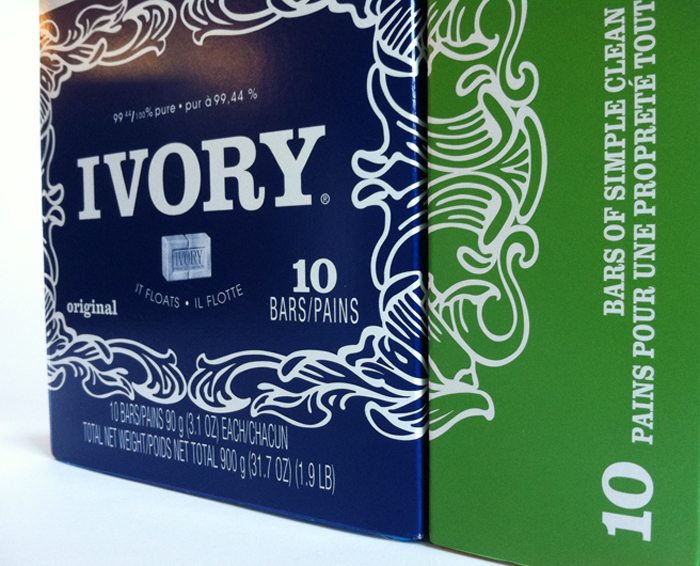 10-Pack Bar version, in Original and Aloe scent. Available exclusively at Walmart in United States. Because the quality of private label brands is often quite high, I wanted to give these packs a high-end look and feel so that it could realistically compete with non-private label brands. I focused on “friendly and traditional” - the swishy font used for the type of cheese is friendly, welcoming and confident. I added a tagline “honesty & tradition” to drive the point home. The navy blue vertical bar mimics a hand-wrapped pack that a cheese shop might use. The flags are placed prominently but vary across pack types. The color palette looks both traditional and fresh. Everything is unified (two yellow circles, tagline in yellow, swishy font is same navy blue as the vertical band, the flags and the teal background. These could be used easily across the product line. Being that this product would be in Penny Market, I made sure the design was not overly-designed, meaning it is easy to read quickly and without trouble the type of cheese and where it comes from. I gave it a high-end look, even though it would be in Penny Market because it would really stand out amoungst the typical packs you see there. Disposable pens are normally packaged in plastic or with a blister pack—both wasteful and rarely recycled. With this redesign I stripped away all except what is necessary for a secure structure to hold the pens. The design itself is minimal—very clean, one color on the package that denotes the ink color with simple, clear typography.